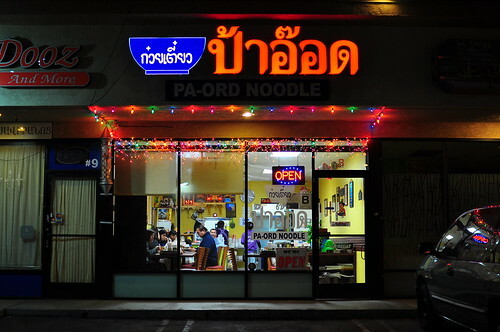 There are plenty of boat noodles to be had in Thaitown, but the return of Lawan Bhanduram, the original owner of Ord Noodle on Hollywood Boulevard, has created quite a stir. After selling her acclaimed restaurant in 2008, Ms. Bhanduram left East Hollywood for Panorama City, leaving Sapp Coffee Shop to rule the boat noodle roost. 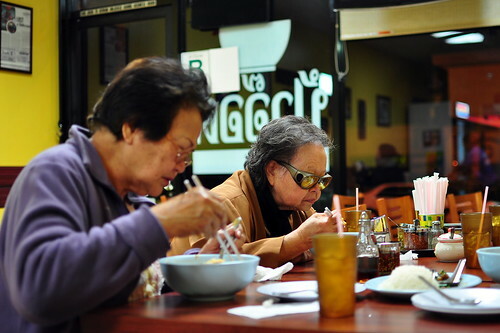 Now that Ord (Ms. Bhanduram’s Thai nickname) is back in her old stomping grounds, the title of L.A.’s best boat noodles is once again up for grabs. The cozy noodle shack was packed with local Thais slurping with gusto when The Astronomer and I, along with our friend Shay, arrived. We grabbed three open seats beneath the gold framed, three foot tall glamour shot of the proprietress. A plaque beneath the portrait read, “I’m not bossy, I just have better ideas.” The tastefully appointed room indicated that this place was gonna be good. Wink wink. 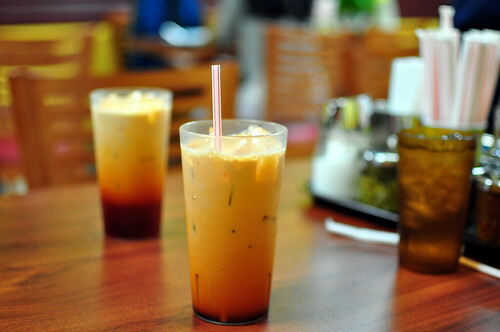 Shay and I immediately ordered two tall glasses of Thai iced tea. 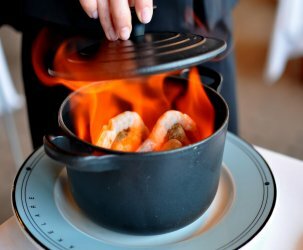 The drink was creamy, sweet enough, and the perfect complement to Ord’s fiery foods. 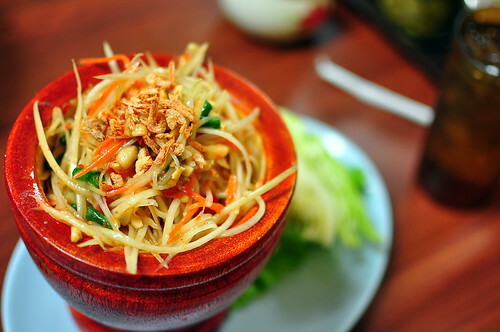 The Astronomer requested that we begin with a green papaya salad, one of his favorite foods from our Bangkok travels. Dotted with toasted peanuts and salty dried shrimps, the salad was incredibly fresh and well-balanced between the herbs and acid. The medium spice level was hot enough to impart beads of sweat on our upper lips. Ord’s famous boat noodles arrived next. The beef variety included thin slices of meat, squeaky meatballs, and my personal favorite, tender tripe. 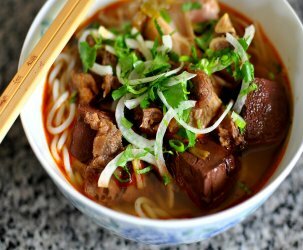 According to Austin Bush, an American expat residing in Thailand, kwaytiao reua or “boat noodles” are so called because they used to be sold from small boats along canals and rivers. These days, the dish is served from landlocked boats since most of Bangkok’s canals have been converted into streets. The bowl of Ord’s boat noodles was everything I hoped it would be—intensely flavorful, slightly funky, and deeply satisfying. The dark brown broth, which contained a hefty splash of pig’s blood, was brimming with a melange of spices like cinnamon and clove. This noodle soup is the complete package. The boat noodles were followed by pork sparerib noodles. 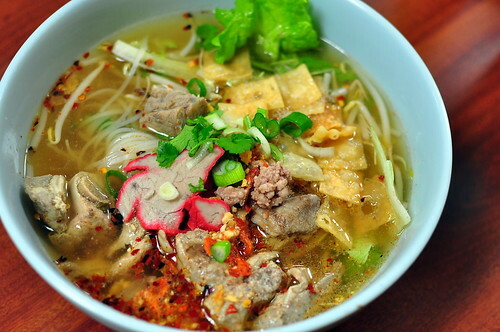 Served with thin rice noodles, ground pork, and pork rinds, this clear-brothed soup packed a surprisingly powerful punch. Though not as in-your-face as its cousin the boat noodles, the sparerib noodles were definitely mighty fine. 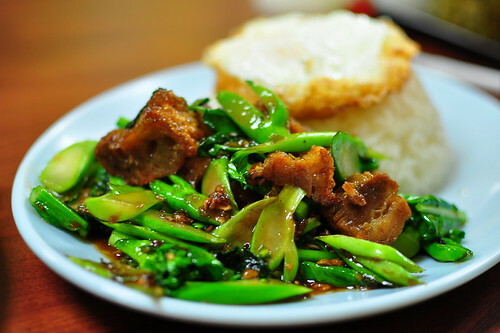 At the suggestion of the lovely Ms. Barbara Hansen, we also ordered khao kanah mu grob, rice with Chinese broccoli, crispy pork, and a fried egg. The sweetly marinaded pork was just what we needed after two chili-laced soups and one very spicy salad. The abundance of garlic and the meat’s unique texture really made this dish fantastic. Next stop, Sapp Coffee Shop. wow, really, best meal of 2010? I know it’s only February but still! Now I really have to go. I fear that the “meat ball” is more literal than figurative, especially since I did eat it. I’m still waiting for her to roll out the khanom jeep she used to rock at Noodle Thaitown. Her boat noodles are definitely a few lengths behind Sapp’s. Plus, I hear the community isn’t exactly stoked at the way she sold her business for kind of a lot, then came back scarcely a year later and opened up a similarly named competitor a block away. Legal perhaps, but not sporting. I can’t wait to try this place to see how it compares to Sapp’s! So glad you included the picture of the lady with the incredible glasses! I do have to stick with my conclusion that Sapp’s boat noodles are the best I’ve had. 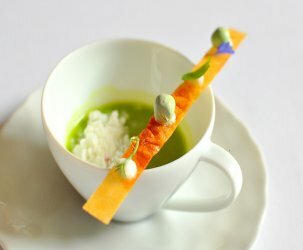 But it was indeed good eating at Pa-Ord, lovely write-up as always. Did you really say this was your best meal this year?? “I’m not bossy, I just have better ideas.” I think I have an original pic of you with those words underneath. If I find it, I’ll let you know. And, i guess it’s good to know there are now two J Gold’s loose around town. 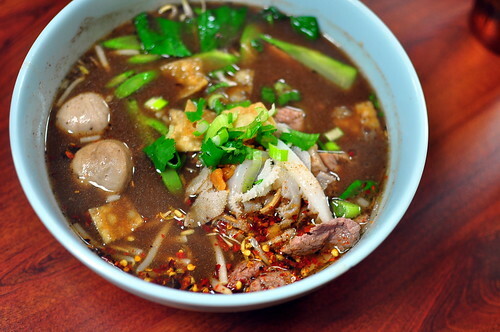 I believe boat noodles can still be purchased in the traditional setting on boats. But that would mean traveling all the way to Thailand. I’m interested to see if this place is better than Sapp, as it’s definitely damn good! Gasp! A sudden craving for Thai food has overtaken me! ravenouscouple: the original ord noodle is really oily, that’s probably what did it. I think the best noodle shop in town in Sapp. Pa-Ord is respectable, but at least in terms of the Boat Noodles, Sapp is supreme. The jade noodles with duck in pork broth at Sapp are also excellent. Just tell them to go easy on the broth – too much overwhelms it. Right when I think our tastes are starting to align, you go and pull pigs blood on me. At lease we have Mozza. Mozza and chicken livers. Diana, you have to try pig’s blood. There are way more offensive things in the world. Gastronomer, You should try the boat noodles at Red Corner Asia (also in Thai Town), it’s pretty darn good and authentic.